It was one of those days where the weather reports totally confused me as to the likely conditions. As I monitored the various forecast websites, I received a mix of reports ranging from “Seas under 1 metre, wind 15-20 knts” to “Seas up to 3 metres, winds 25-30knts, gusts 40% higher”. At one end of the spectrum, a pretty flat calm day. At the other, a nasty messy windy storm front. 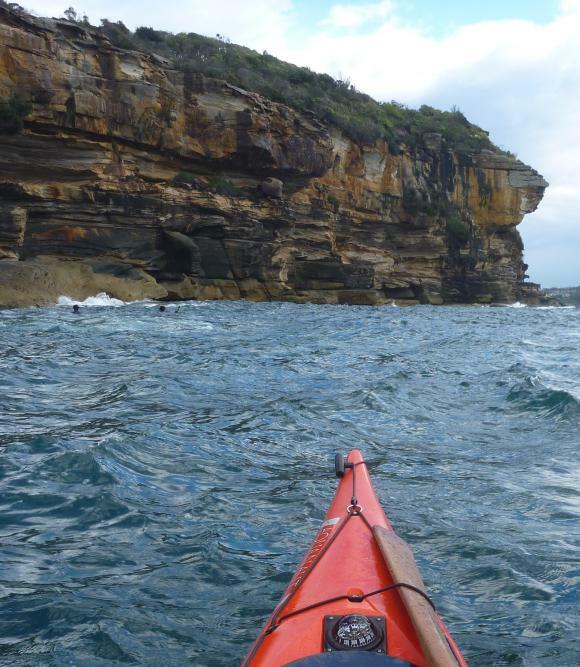 So I took off to The Spit and decided I’d make a decision once there – if calm, I’d head out towards Sydney’s Heads. If not, I’d take the scenic route up Middle Harbour. When I arrived, the water was like glass and the wind barely noticeable, so I took off in the direction of Middle Head to have a better look. When I arrived at Middle Head the sight was beautiful. The cliffs were awash with early morning amber light, with calm seas but a nice little 1.5 metre swell rolling in forming little sucky breakers on the rocks. 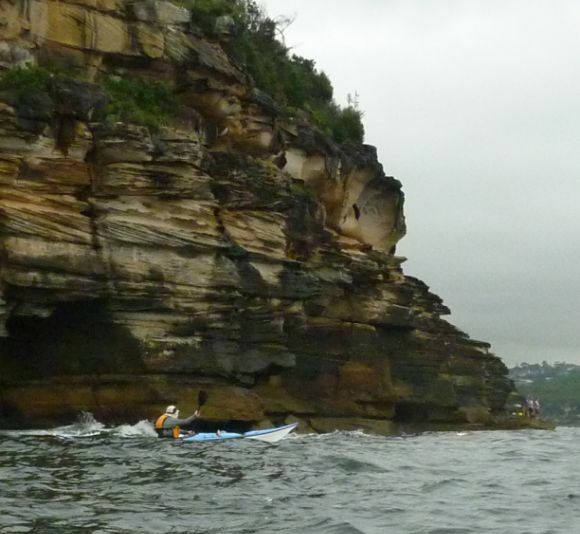 The conditions were magnificent, so I paddled up to within about 5 metres of the cliff and sat in the break zone, enjoying the start to the day. 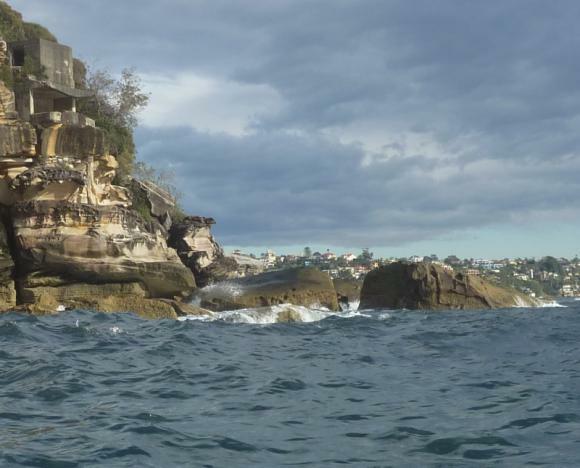 Then I took off, hugging the shoreline back into Sydney Harbour and round to Bradleys Head, enjoying the magnificent coast of Sydney Harbour. But as I continued, the sky started to cloud over, and a decidedly strong wind started to pick up behind me, so I decided to turn back into it and start the return journey. 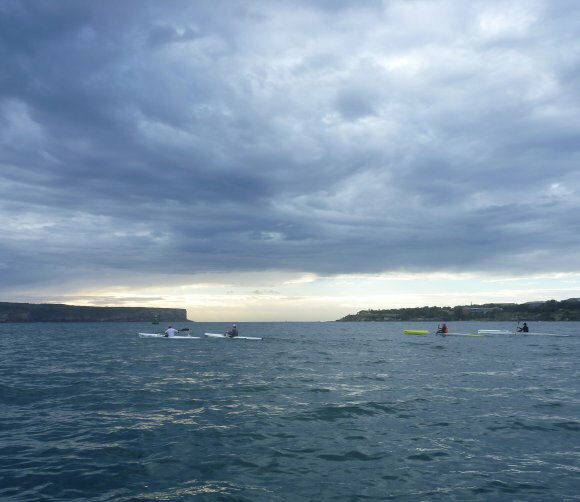 The dark grey moving clouds over North Head told of the incoming front, as if the rapidly rising headwinds weren’t giving it away. 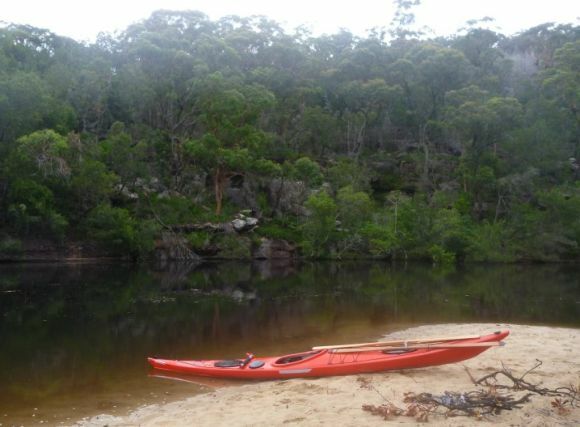 I like paddling into the wind though, and managed to match it with some ski paddlers briefly as I powered through the building chop and into the spray. When I finally returned to Middle Head, the conditions had dramatically changed from the calm conditions a few hours earlier. 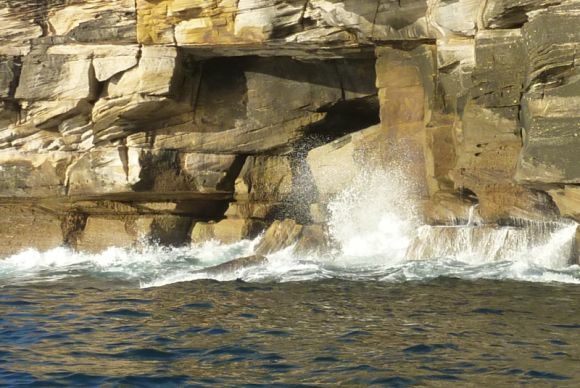 Now 2-2.5 metre swell was rolling in through the heads and pounding the cliff-face, erupting in huge plumes of spray before rebounding back out. The rebound and incoming swell mixed together made for some sensational lumps, and the churned up waters looked a brilliant aquamarine blue. Wanting to record the crazy waters, I pulled out the camera and recorded a good minute of the action before paddling off to calmer waters. Then as I moved further along the head, I pulled the camera back out for another shot and realised the video was actually running. Turns out I’d not recorded any of the cliff action, but had instead recorded a couple of minutes of the darkness inside my PFD pocket! 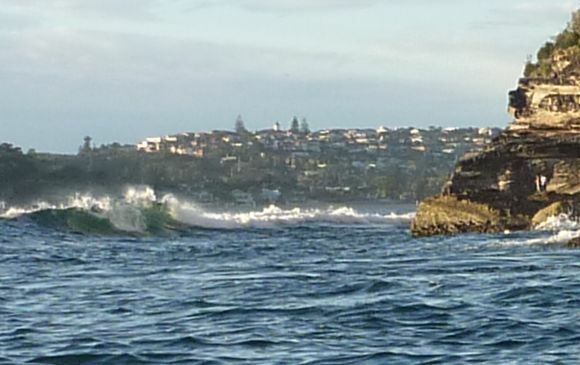 In the next to last photo of choppy waters are those swimmers/surfers heads or just some well rounded rocks? 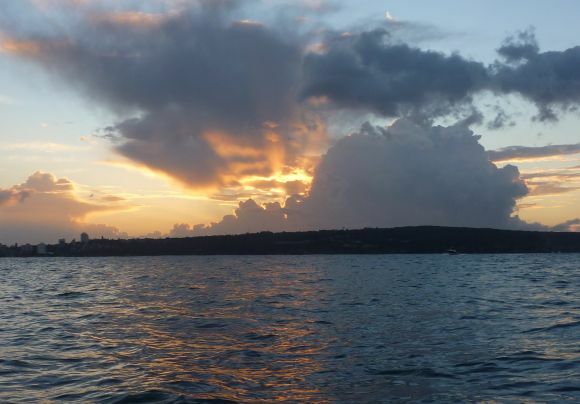 How rough can it really get in the harbour–cant be as rough as on the open ocean? Does anyone go out on rough days?